San Damiano Mission, Kemondo, Tanzania, has been a sponsored ministry of our Province since July 28, 1999 and it closed on May 16, 2017. In the summer of 1998, Reverend Father Thomas Tibainuguka from Bukoba Diocese, Tanzania, visited Springfield, Illinois, and met several of our Sisters. The Sisters discussed their vision of missionary work in Africa with him. Father Thomas secured a meeting with Reverend Bishop Nestor Timanywa of the Bukoba Diocese. 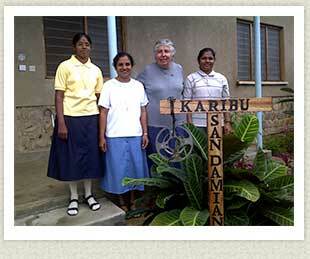 In March 1999, the first delegation of Sisters toured the Bukoba diocese. When they reached Kemondo, they found a worn San Damiano Cross hanging over the altar of the simple church. It touched them to realize that other Franciscans had served the people of Kemondo. That Spring, Sister Anne Carlino and Stefanie Koester, a lay associate from Germany, were commissioned as missionaries to Tanzania. They arrived on July 28, 1999. Building of a convent and mission house began in January 2000. On May 13, 2000, a village feast was held, and Bishop Nestor and the people welcomed the missionaries to Kemondo. Since that time, Sister Anne and other Hospital Sisters from our international community have continued to serve the people of Kemondo. We are grateful to Sister Anne and all who served with her over these 18 years in bringing hope to those who suffer and being Christ's healing presence. Would you like to know more about this Mission? Please click here.